This book is a wake up call from complacency. Whether we are conscious of it or not, we have been asleep at the gardening wheel. 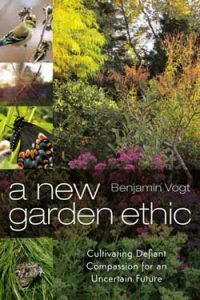 Vogt’s message exhorts us to make the change to a purely native palette by digging into the psychology, sociology, and theology behind our reasoning for the plants we choose, or don’t choose. A New Garden Ethic questions the root reasons of why we garden and for whom do we garden. Vogt believes that collectively we are experiencing a deep grief that makes it difficult for us to make positive changes and adopt this new garden ethic. The irreversible loss of pristine ecosystems, the death and mass extinction of unique creatures, and a burning out of our once intimate relationship with nature, define the mental suffering we are experiencing in the Anthropocene age of human impact. He goes on to describe the stages of grief, and how those stages are reflected in the rationale that we give when defending our choices to plant non-native species. This book’s message is universal: there is a greater purpose in designing gardens and landscapes that goes beyond the whims and desires of our clients or even our own artistic vision. And this message applies to all regions. Vogt is ardent in his belief that gardens are not Art. They are a place for us to defy the environmental destruction all around us, challenge the social norms in landscaping, and create a place for people to deeply reconnect to nature. The planet needs us to act. We need to act. Time is up.